I know, I know it’s been a hot minute but if you’ve been following my social media you would know why I’ve been MIA for such a long time. I will eventually write a post on what happened but I’m not quite ready to write it. Anyway, I thought since I haven’t written a skincare related post since this one and I have been trying new products, I thought I would share. Today’s post is all about two products by Omorovicza I’ve been using on my travels. I’m talking about the Refining Facial Polisher and Moor Mud Cleanser. If you’d like to know if these Omorovicza face products are worth purchasing keep reading. I bought these products as a set in a Christmas cracker because I always wanted to try this brand and it was perfect for travelling in your hand luggage. I’m a big fan of exfoliation; both the chemical and manual kind. I have been using chemical exfoliators but sometimes it isn’t always convenient to travel with. This facial polish does not smell chemically, it’s more of a marine scent which is nice. This particular Omorovicza face product is dark green in colour and obviously has a grainy texture to it since it’s a facial polish. For my skin type, combination/oily, I used it 2-3 a week depending on what my skin needed. I found that my skin felt smoother and looked brighter after use. It didn’t aggravate the redness that I have on my cheeks nor did it break me out. My pores appeared smaller which is a plus for me. This is Omorovicza’s award-winning cleanser and I can see why. First off it looks like mud but feels like a cream when you apply it to your skin. Similar to the polish there isn’t a chemical scent but more earthy. There really isn’t a texture to it and I used this every day whilst I was away. When I first used this cleanser I didn’t think it would do anything for my skin but I was wrong! Its gentle texture does not mean weak. Actually, what it did for my skin was to gently cleanse it without compromising the integrity of my skin. 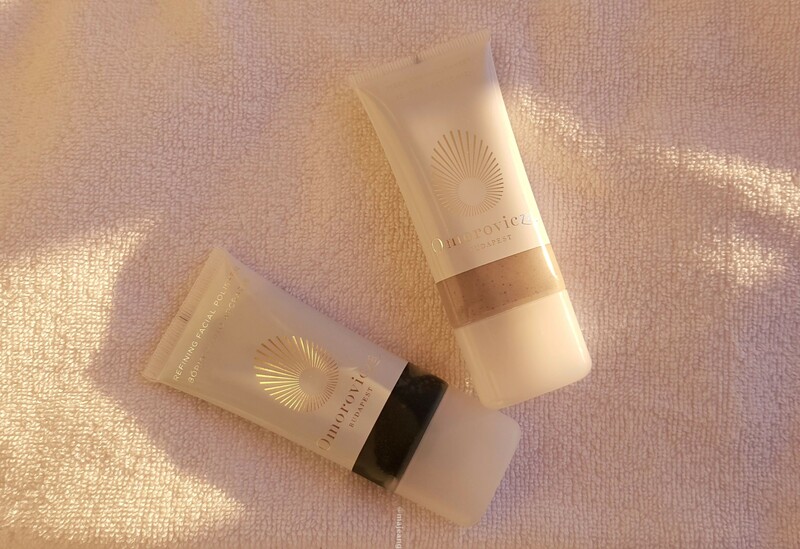 I really like these Omorovicza face products and would love to try more. I understand the price point and it goes to show, you do get what you pay for. Have you tried any Omorovicza face products? Do you think it was worth it? Let me know in the comments below. As always thank you for reading and don’t forget to subscribe. It’s free!